For businesses with websites (which is pretty much 99.9% of all businesses) Google Analytics has become ubiquitous for finding out information on online performance. It collects a lot of potentially useful information without users having to lift a finger, such as website visits, page views or advertising performance. However, with so much information readily available, it can be a challenge to know exactly how to use this data for decision-making, whether by itself or alongside your other KPIs. This is why we think that GA can be even more useful if you include it with your other data in your dashboard software. With all your data in one place, you can do lots of useful comparisons and analysis to create powerful overviews. This article will show you why Google Analytics data can be even more helpful in an external KPI dashboard, as well as how to integrate some useful GA data with your existing KPIs to make your decision-making even better. Google Analytics exists primarily to give you an overview of the volume and type of visitors you’re getting to your website in a certain timeframe, and show it by different categories. However, it’s important to understand that not all data from Google Analytics is necessarily KPIs. For the most part, GA displays a few incredibly useful metrics, and lets you see different views of them. Depending on the goals of your site, you may be inclined to adopt any combination of these. · Returning and New Visitors – If you’re trying to increase the visibility of your product, you might measure New Visitors as a KPI. 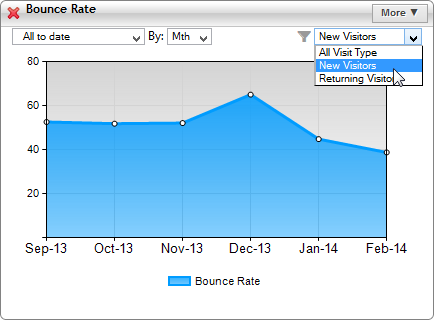 However, if engagement is your goal, returning visitors would be more important. · Bounces – Measuring this as a KPI is useful for engagement, but also for determining the effectiveness of landing pages. · Page Views – Monitoring the number and distribution of page views to your site can help you tweak it to emphasise certain parts (product types, for instance). So, you can see that each of these metrics can become KPIs for different people. However, some issues crop up when using KPIs from Google Analytics, mainly when comparing and reporting them with your other KPIs. While Google Analytics can create reports on different views of each of the above metrics, combining these KPIs with your offline KPIs can be awkward, as GA only generates reports of its own data. Using an external dashboard for your GA data, you can make it a lot more useful and visible for your organisation. Using data from Google Analytics with your other data sources can be a bit problematic since GA reports are self-contained. Importing the data into an external dashboarding application remedies this, since all of your data will usually be stored in one place. You can then use data from multiple sources (including GA) to create direct comparisons which provide decision makers with everything they need to take action. For example, imagine you want to see your sales data alongside your website conversions. This will let you how many sales are driven by your website. With dedicated dashboard software, you can easily get GA and compare to data stored in a totally separate system. One really useful thing you can do with Google Analytics is to view your data from a different perspective, such as by a certain country, device or webpage. However, you only ever view one of these on a single GA chart. So, you can’t directly chart website hits from UK alongside those from the USA, for instance. While you can have your GA tables show values by dimension, you can’t display time-based information in this way. With external dashboard software, you can get around this by pivoting your data by dimension. You can then directly compare different dimensions over time. Imagine being able to combine data from GA with your other KPIs to create a more powerful, meaningful metric. You can do this by using your GA KPIs in a formula. For example, let’s say you’re using a KPI dashboard system like Target Dashboard to report on the percentage of bounces on your site (called the bounce rate). While you could have just imported the bounce rate itself from GA, it’s better to import bounces themselves, as you can now create a formula which will show the bounce rate of whichever dimension you filter by. As you can see, this bounce rate will now change according to which dimension is filtered, making it incredibly versatile and meaningful. On a more complex level, combining metrics from multiple sources can give you additional detail of your activities. For example, you could use your new visitor metric alongside marketing spend to see your cost per lead, and plot this on a marketing dashboard. Since your data is all located in one place, this becomes possible. KPI data needs to be shared, as the best decisions are made through collaboration. External dashboard systems can provide a wealth of sharing options on top of what GA already provides, with advantage of including non-GA KPIs in reports. 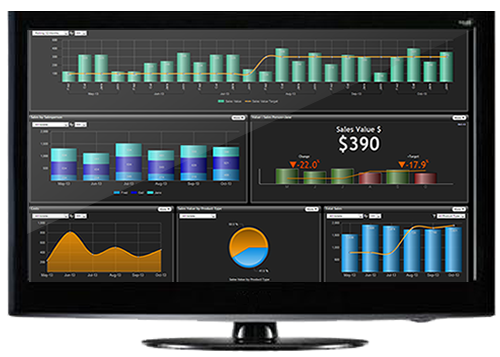 Imagine your marketing team working from a big screen display, using Analytics data with other KPIs to increase effectiveness. Or, you could present comparisons between website hits by country in a PowerPoint-style presentation at the next meeting. Google Analytics provides webmasters with virtually everything they need to monitor their websites. However, when it comes to wider reporting over many different business sectors, managers need to be able to combine GA data with their other KPIs, and compare it directly from many different perspectives. This is where an external dashboard system comes in, as it allows GA data to be viewed, manipulated and shared in many ways which complement what GA can already do. This article has shown some of the ways which external dashboards can take GA data and make it more visible and versatile. 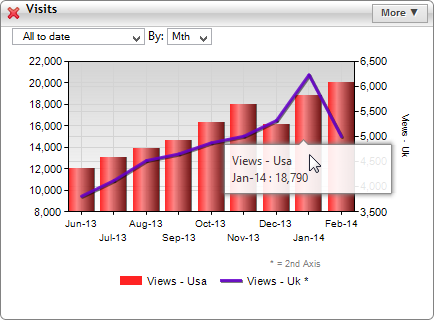 Do you need some help implementing Google Analytics data with your dashboards? 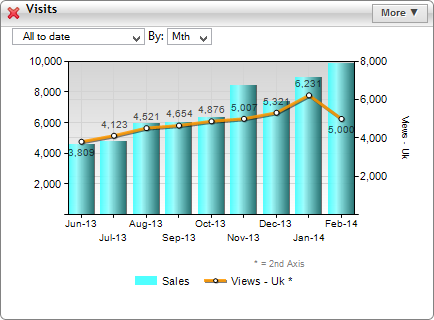 Why not see what Target Dashboard can do to help you? Contact us today, or check out a free 20 minute demonstration and see for yourself.